This article was written for boilers or water heaters, but it really applies to any type of HVAC System including gas, oil, and electric furnaces, heat pumps, and air conditioners. In fact, anything with electrical parts, motors, blowers, or insulation can be affected. Especially freezers, refrigerators, and dehumidifiers. DANGER: If any part of a boiler, burner or its controls has been sprayed or submerged under water, either partially or fully, DO NOT attempt to operate the boiler until the boiler has been either replaced or completely repaired, inspected, and you are sure that the boiler and all components are in good condition and fully reliable. Otherwise, by operating this boiler, you will cause a fire or explosion hazard, and an electrical shock hazard, leading to serious injury, death, or substantial property damage. Replace all controls, gas valves, and electrical wiring on the boiler. Once an electrical control has been wet, it poses a fire and electrical shock risk and must be replaced. Gas valves are no longer assured to provide a safe shut-off to the gas, potentially causing gas leaks, fires, and explosions. Even mechanical devices such as float low water cut-offs and safety relief valves need to be replaced, as their components may become corroded, making the device unreliable for future use. Thoroughly inspect all burner tubes, gas piping, manifolds, orifices, and flue ways for signs of rust and/or sediment from the flood waters. The rust and sediment can prevent proper operation of the boiler if it is not cleaned out from the boiler. For oil-fired boilers, replace all oil burners. Oil burners are complex systems consisting of solenoid valves, motors, electrodes, and pumps. If these components have experienced flooding, oil leaks, valve failures, and electrical faults may occur resulting in a severe fire hazard, potential injury or death. In the case of large commercial burners, it is more cost efficient to replace the entire burner rather than attempting to replace all the controls and repair the mechanical components. Replace all insulation that has become water damaged. This includes jacket insulation, base box insulation, and combustion chamber insulation and refractories. After insulation has become water damaged due to flooding, it may deteriorate, reducing its insulation value and causing a potential fire hazard. Also, it can pose a health risk due to bacteria from the flood waters remaining in the insulation. Where possible, inspect seal rings for damage from petroleum products. Flood waters are often contaminated with gasoline and other petroleum products, which damage elastomer seals used on many boilers. Thoroughly inspect all venting for signs of corrosion. Replace any venting that is rusting or corroded in order to prevent flue gasses from entering the building through the venting system. NOTES: Even if only part of the boiler has been submerged in flood waters, replace ALL controls, gas valves, and other components as noted above. There is no easy way to know which components may be damaged; and even if a control was not submerged, water can get inside components because of splashing, wicking action, and/or moisture in the air. 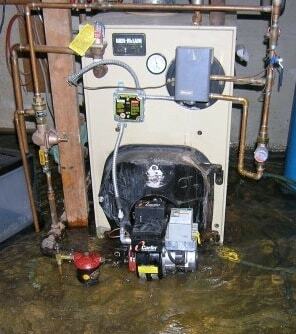 Water and sediment easily enter controls, wiring, and insulation and other boiler components. Even if you can not see obvious signs of penetration, water and sediment may have entered a device and render it unsafe.